Faça visitas guiadas a dois sítios arqueológicos populares na Riviera Maya - Tulum e Coba - durante esta viagem de um dia de Cancun. Depois de fornecer uma introdução às tradições culturais locais com uma visita a uma comunidade maia, o seu guia certificado lança luz sobre as ruínas antigas. Veja as vistas do Caribe a partir de Tulum e suba a Nohoch Muul, a mais alta pirâmide de Yucatán, em Coba. Almoço e transporte de ida e volta do hotel estão incluídos. Our tour was horrible. When we booked the tour we were excited to spend the day touring around the Tulum and Coba. The day started off fine. We had a nice tour guide who seems to know a lot. However, when we first got to the Tulum we were told we only had an hour and fifteen minutes to walk into the Tulum and tour them. We then proceed to wait in line for our tickets for another 10 minutes after slowly walking in. When we got in, the Tulum its self-was amazing. We were rushed through and told to meet at the van at this time and don't be late or you would have to take a cab to Coba which by the way was an hour away. We made it in time. No problem there. We traveled to lunch which says chicken fajitas. Beef Fajitas, panela cheese or chile Relleno. It was not. It was pulled pork and who knows what else. This was the only place to give myself and my family an upset Stomach after we had been in Mexico for 6 days at this point. It took 7 days at home to recover. Then we went to Coba which at this point our tour guide told us that we had one hour. If we wanted to have the guide with him we had to spend the money on the bikes which were cheap 30 pasos. Unfortunately, if we took the bikes we would not have time to climb the steps in Coba. Which was the whole point in us wanted to see Coba. So my family child 10 and 12 rushed in as fast as we could, we raced up the steps saw for 15 seconds and down we went to rush back. Just to have our tour guide be 10 minutes late. We were all rushed in order to see this underwater cave swimming which we didn't even know we were doing because it wasn't supposed to be part of our tour. So my family didn't even have our swim suits. Which was all fine cause we were rushed there as well with an hour to change and swim and change again. Then after all of this a long day of rushing around we were brought back to Playa Del Carmen to do some shopping which again was not what we booked and were there the day before. We left in a cab and went back to out hotel. I will never book with this company again. I totally recommend The Coba and Tulum. Beautiful!! Would love to share pictures but didnt take many as we had little time. 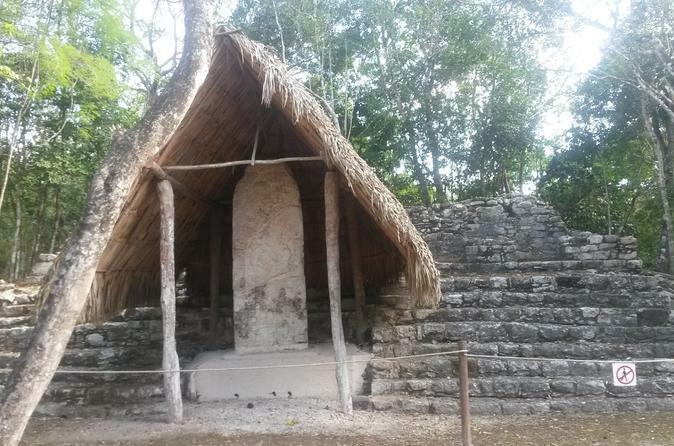 A good tour to see different aspects of Mayan life a trade center Tulum and a religious center Coba. A nice lunch and swimming in the cenote are nice additions to the ruins. Just our tour guide was quite lazy - just a few explanations somewhere in the middle of the site and then go and look yourself - at the same time I saw other tour guides going round with all kind of picture materialexplanations. We were picked up late and put on a tour that was slightly different to the one we had booked. The tour company had not advised us of this and there was some confusion at the depot before departure. The bus had to drop off some people to another tour on the way which made our start late and we ended up not having enough time to spend at Coba or Tulum. Time is definitely required because of the large amounts of people at the sites and the distance between the ruins. Coba and Tulum are definitely worth the visit! Overall, this was a fantastic tour. Both sites are definitely worth checking out, and our guide/drive was engaging, friendly, and informative. The lunch was very good as well. Some caveats - this tour is actually 2 parts of a 3 part tour. The third and final part is a Cenote swimming pool cave, and you have a choice of either staying longer like an hour at the Coba ruins kind of pointless, or pay the bit extra for the swimming stop like 10 currently. We hadn't signed up for the swimming, and the guide forgot. So when we got there we just had to hang around for an hour with nothing to do and with quite disgusting bathrooms. Other caveat: If you're coming from the Cancun peninsula like we were, the transfer can take almost 3 hours each way with all the other stops you have to do for the others in the bus! So, our excursion ended up lasting about 14 hours in total and completely occupied the day.